Welcome to our website for Acoustic Juice. Please take a sec to let us know you were here, and check back often for updates. Upcoming Events: Acoustic Juice will be attending Open Mics again and working on new material, as well as some Studio time. Check out Open Mics, they're all over the place. It's a great way to get out and support your local musicians and hear alot of good talent. Two videos of us sittin' in with Mid Life Crisis. Check out our page on Facebook for more music and updates from us! 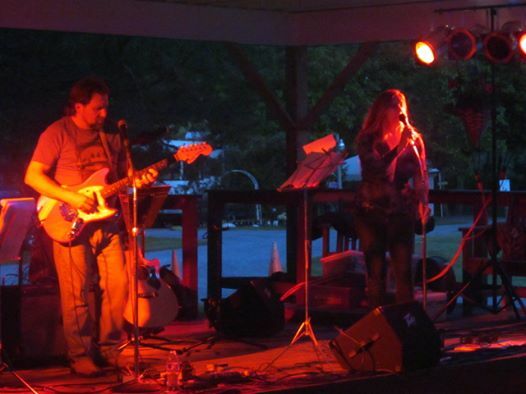 Acoustic Juice is a 2-piece band featuring the husband and wife team of Randy and Tammy Karstetter. Randy is an accomplished, self-taught guitarist who is the original founding member of Acoustic Juice. The band began many years ago consisting of 3 acoustic guitars and 3 vocals. At that time, Randy, Bob and Steve played mostly classic rock. Alot of Crosby, Stills, Nash and Young, America, the Eagles, Dylan and more. After several years the members moved on, Bob to pursue other musical interests and raise his daughters. Randy married, raised his daughter and son, and continued to play and write on his own. Eventually, the band was recreated, this time with the addition of the third vocal being Randy's wife, Tammy. With the third vocal being a female, the band not only did all the original classic rock from before, but added tunes from Sheryl Crow, Heart, Stevie Nicks. Also some blues, Bonnie Raitt, Tracy Chapman, Eva Cassidy, Melissa Etheridge, Susan Tedeschi, Crystal Bowersox and Etta James. Randy covering Neil Young to a tee, along with many Original songs that he has written and always learning material to add to the Song List for all ages to listen to, younger folk and older folk as well. Once again the band has evolved, is ever-changing as most bands are. Bob has moved on to pursue other opportunities, and Randy and Tammy are taking this opportunity to learn new material, as well as keeping the old. Acoustic Juice has evolved many times over the years, but has always maintained recognition for having awesome vocals with harmonies that blend so well, that at times it's hard to distinguish between them. With Randy playing acoustic guitar, Tammy helping out with percussion instruments and those awesome harmonies, Acoustic Juice is a must-see duo and definitely worth the time!